Medina Mosque. GV, exterior, general view, stock. Southampton Medina Mosque is the first purpose built Mosque in the south of England. The building work started in 1990. 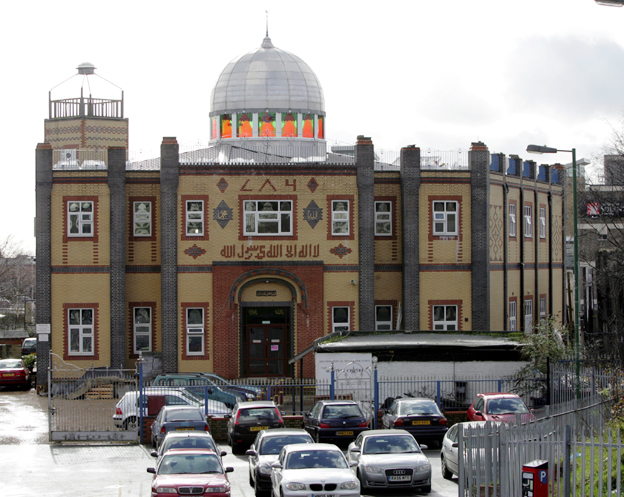 The Mosque has been built with the donations of time and money by the Muslim community of Southampton with the land upon which it is built having been sold to the Muslim community by the local authorities. The Mosque first opened its doors to the public in 2001. It is one of the most recognised and noticeable religious buildings in the city of Southampton. The SMMTL is an affiliate of the national Muslim umbrella organisation, Muslim Council of Britain (the MCB) as well as an affiliate of the Muslim Council of Southampton. It is also a member of the Mosques and Imams National Advisory Board (the MINAB) Southampton Medina Mosque Trust Limited. The governance of the Mosque and the services that it provides have been nationally recognised. It is named as one of the top centres of excellence mosques in the country. The ability and commitment of the SMMTL to promote a cohesive and harmonious society has made the Mosque a much sought after venue for Inter Faith functions and events. The SMMTL co-operates with the work of the Three Faith Forum and has close links with the Wessex Jamaat. It also has effective partnerships with national charities such as Islamic Help, Islamic Relief, Muslim Hands and Muslim Aid. The Mosque is managed by the Southampton Medina Mosque Trust Limited(the SMMTL), a registered charity and a company limited by guarantee. Members of the Trust meet once every year to elect a Board of Trustees which then elects its office bearers. The Main Hall is one of the primary features of the mosque and is the most widely used area within the Mosque. All of our congregation are familiar with this particular area as it is where Muslims attend regularly for their five daily prayers. There is a dome within the Main Hall which acts as a centrepiece of the hall. The Mosque is under construction and once complete there will be a display chandelier under the dome. The minaret is also accessible from the Main Hall and this is where the Muedhin announces the Call to Prayer (Adhān). The minaret is under construction and when complete it is hoped will be accessible to visitors. The Main Hall features an arch (Mihrab) known as the Qibla wall. This wall faces towards the direction of the Kaa’ba in the city of Mecca and indicates the direction Muslims must face when praying to Allah (SWT). There is also a pulpit positioned beside the Mihrab, from where the Imam addresses sermons and lectures, this is known as the Minbar. Copies of the Holy Qur’an in various languages are also situated along the Qibla wall. The Main Hall is carpeted throughout with a richly decorated carpet which was specially designed and manufactured for SMMTL. The carpet design is designed for each individual to have their space during prayer. The carpet is always kept clean and no shoes can be worn on the carpet. There are numerous pillars to support the structural design and arch shaped green tinted windows lining the Mosque Main Hall. The hall is centrally heated using an underground geothermal heating source. The Main Hall, like the rest of the Mosque, hosts a network of speakers for the amplification of lectures and prayers. The Main Hall is also equipped with a projector and large white screen. The Main Hall has a capacity of 1,000 to 1500 people which is about the average turnout on a busy Friday. During the main two festivals of EID the mosque has to resort in two separate congregations as to accommodate the large number of people which and not all be accommodated in one congregation. The ground floor hall serves multipurpose use. 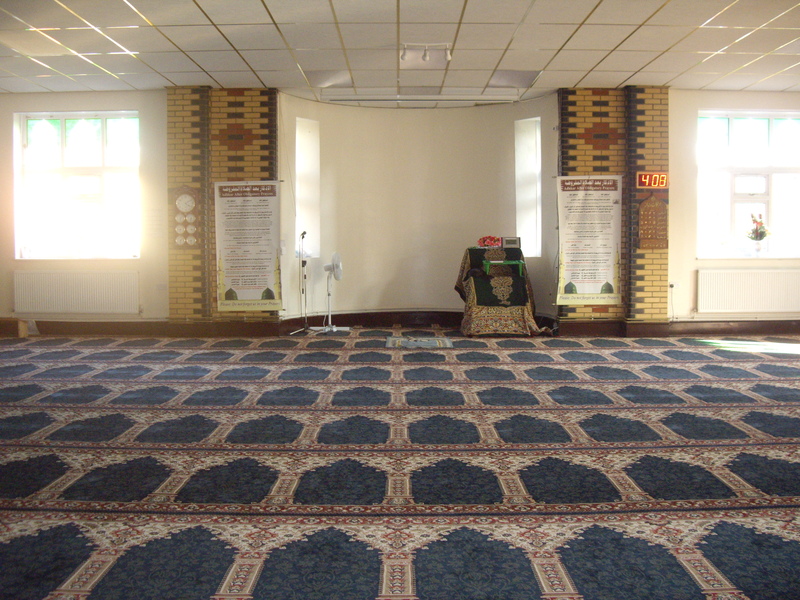 The hall is carpeted with the same carpet used in the Main Hall and also has a mihrab. In smaller congregations this hall is used for prayers during the day, the hall also used for different events such as marriages, lectures, meetings, children Islamic classes and so on. 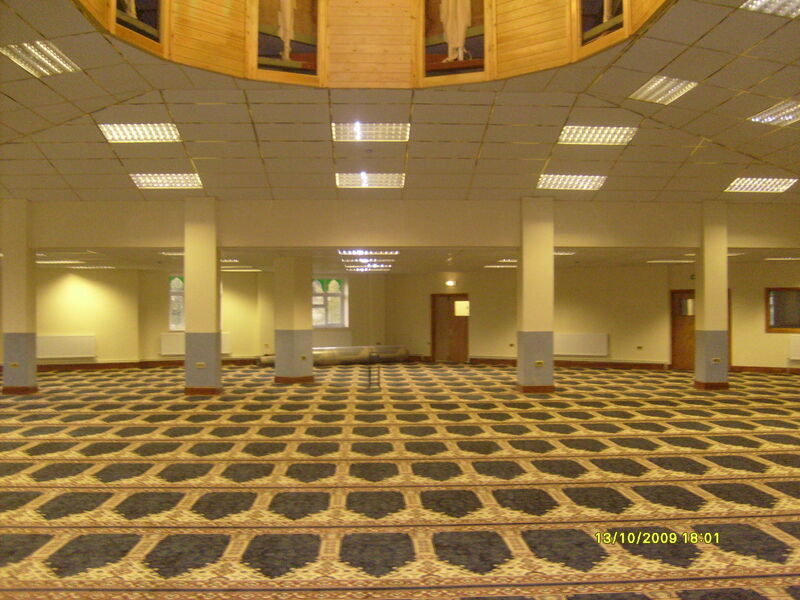 It is also a reception room for visitors and school groups and serves as the Mosque’s main function hall. The hall provides a projector screen and fully audio integrated facilities. There are also book shelves with various Quran translations in different languages and a large collection of hadith (sayings of the prophet). There are two main external features of the Mosque which project the Muslim community across the Cty. 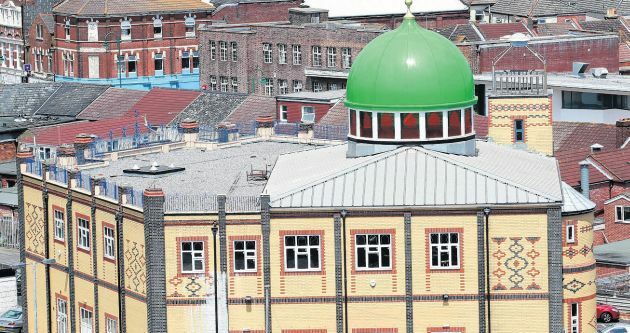 They are the stunning green dome which sits at the top of the Mosque building and a small minaret which once complete will be towering above the dome and visible across the City centre. The dome, which is made from fiberglass, is green in colour and designed to be maintenance free. The colour of the dome was chosen to reflect the dome of the Prophets Mosque in Saudi Arabia The dome is a feature that is commonly associated with Mosques in many countries although it has very little religious significance. The dome at its peak is crowned with a gold coloured crescent moon, a symbol largely associated with Islam and new beginnings. The minaret, however, is from where the Muezzin would traditionally announce the Adhān, the call to prayer to everyone on the local area. This call is still declared by the Muezzin from the minaret but by way of an electronic audio system located at the base of the minaret which then amplifies the live broadcast across the Mosque building and outside via speakers. In the UK the minaret does not serve its purpose to announce the Adhan aloud in speakers but the design is symbolic and come to represent Muslim Mosque around the world and recognizable from a distance of the being of a Mosque. There is limited access within the minaret as it is not complete. Once the minaret is fully erect one standing in the peak of the minaret would be able to see most of the new city centre buildings and landmarks. The Muslim will also get a feel of how the Adhān would have been made during the time of the prophet. Posted in Safar-i and tagged KAG 2016, madina mosque, mcb, muslim britain, muslim community in britain, southampton.